The Panasonic RF-2200 receives the AM, FM and shortwave bands. 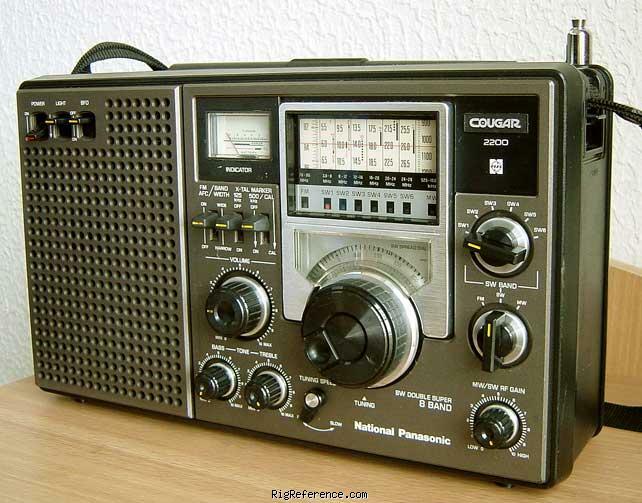 Ranges: .525-16.1, 3.9-8, 8-12, 12-16, 20-24 and 24-28 MHz plus FM. This radio features a very accurate analog dial. It has an S-Meter, BFO, FM AFC, Bass, Treble, Record Jack, Two Tuning Rates, Dial Lamp, Dial Lamp Switch, RF Gain, Calibrator 125/500 kHz and External Antenna Terminals. This dual conversion circuit features wide and narrow selectivity (5/3.4 kHz -6dB). The rotatable ferrite rod antenna makes the RF2200 a strong medium wave performer. Early production models where gray (as image above), later models where black. The European counterpart is called the National / Panasonic DR-22. Estimating the value of a rig can be challenging. We collect prices paid by real hams over the years to help you estimate the current value of the National / Panasonic RF-2200. Just bought or sold this model? Let us know what you traded it for and help other ham operators!